Join	us	for	the	27th annual	Mt. Charleston	Hill	Climb! 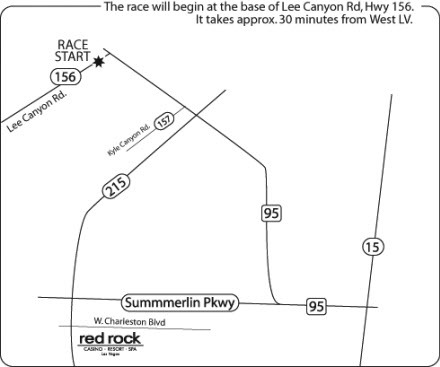 Race	begins	at	the	base	of	HWY	156	and	ends	at	the	Las	Vegas	Ski	and	Snowboard	Resort. Distance	is	17.5	miles	and	5,375	feet	of	vertical	elevation	gain. Two	feed	zones. Awards,	food	and	festivities	at	the	finish	after	the	race. Late	registration	and	registration	at	packet	pickup	is	$50. Entry	fee	includes	BBQ	lunch,	arm	warmers,	and	sponsor	goodies. Over	$1,900	will	be	awarded! If	you	do	not	have	a	USCF	license,	a	$10,	one-day	license	will	be	available	forpurchase	when	you	register. Packet pick-up and late registration will be held at McGhie's - 4035 S. Fort Apache, Las Vegas, NV 84147 on Friday,	October	5th 10:00AM	to	7:00PM. Registration	and	packet	pick-up	will	also	be	available	the	morning	of	the	event at	the	start	from	7:30AM	to	8:45AM. Trainer	required	for	warm-up,	there	is	no	warm-up	allowed	on	HWY	156. A	trailer	will	be	provided	at	the	base	for	you	to	drop	off	warm	clothing	for when	you	reach	the	top. Clothing	must	be	in	a	bag	and	clearly	marked	with	your	name. We	will	not	be	responsible	for	missing	or	lost	items. All Proceeeds to Benefit Every Kid A Bike!